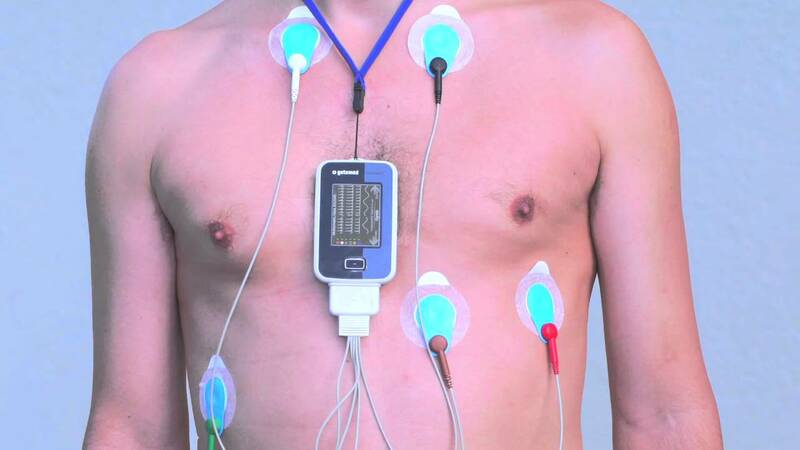 A Holter monitor is a continuous tape recording of a patient’s EKG for 24 hours. Since it can be worn during the patient’s regular daily activities, it helps the physician correlate symptoms of dizziness, palpitations (a sensation of fast or irregular heart rhythm) or blackouts. Since the recording covers 24 hours, on a continuous basis, Holter monitoring is much more likely to detect an abnormal heart rhythm when compared to the EKG which lasts less than a minute. It can also help evaluate the patient’s EKG during episodes of chest pain, during which time there may be telltale changes to suggest ischemia (pronounced is-keem-ya) or reduced blood supply to the muscle of the left ventricle. The only requirement is that the patient wears loose-fitting clothes. Buttons down the front of a shirt or blouse are preferable. This makes it convenient to apply the EKG electrodes, and also comfortably carry the monitor in a relatively discreet manner. Holter monitoring is extremely safe and no different than carrying around a small tape recorder for 24 hours. Some patients are sensitive to the electrode adhesive, but no serious allergic reactions are known. The report is provided to the physician, together with multiple EKG strips after the tape has been scanned by the technician. If the technician sees a rhythm that is life-threatening or potentially dangerous the physician is informed immediately. Otherwise, it may take a few days before you get the official results from your physician’s office. At that time, you may also receive additional recommendations based upon the results of the test.